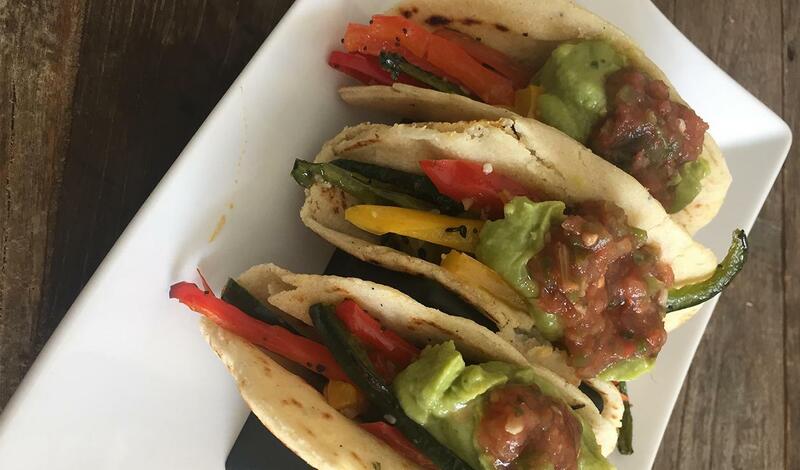 Pairing Hellman’s Ranch and the traditional Mexican masa to create delicious bold tortillas that put a new spin on flavourful profiles for vegetarians. Place masa harina and flourin a bowl.To make this gluten free, omit the flour and add one extra cup of masa harina. Add Hellmann's® Creamy Ranch Dressing and mix well. The tortilla dough should hold tough when squeezed. It should not be sticky nor should it be dry. If sticky, add more masa harina. If dry, add more Ranch dressing. Wrap the dough with plastic wrap and leave at room temperature. Place all of the vegetables, cilantro, spices, and olive oil in a bowl and toss well. Place on a sheet tray and roast at 350F/180C convection until cooked through, about 20 minutes. Portion the tortilla dough to 1-2 oz each and lightly knead it in your hand to form a ball. Make 30 portions. Prepareeach tortilla press by lining it with a folded piece of parchment paper. Press each tortilla and cook in a non stick pan, griddle, or comal for about a minute on each side. Holding one tortilla in hand, place some of the vegetable mixture inside and repeat for the 2 other tortillas. Top each taco with 15 ml of guacamole and 5ml of salsa roja.